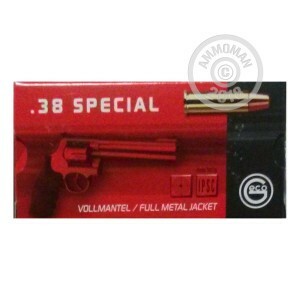 These full metal jacket .38 Special rounds from GECO make for great practice and match ammunition in all size revolvers. Whether you are seeking good training with your pocket J-Frame .38 or looking to introduce a novice shooter to your full size .357, this ammo is versatile enough to meet multiple range applications. GECO is a German ammunition company that is known today for their undying support of the shooting sports like IPSC and their status as a major ammo supplier to European shooting teams and law enforcement in other countries. With experience dating back to 1887 combined with constant feedback from competitive shooters, GECO works hard to maintain their reputation with expertly crafted loads based on lessons learned in real world shooting applications. The 158 grain bullets chosen for this load fit the weight profile of a round famously used by U.S. law enforcement in the 60s and 70s to effectively end many deadly threats. With a standard pressure charge, these rounds provide a smooth but strong recoil impulse which replicates self-defense ammo in pocket revolvers or makes for light practice loads with larger wheel guns. The shape of the full metal jacket bullet is similar to a semi-wadcutter but with rounded edges which reduces drag in flight and leaves clean holes in paper or cardboard targets. 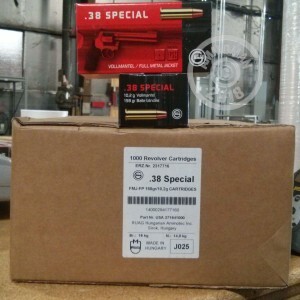 Each round is assembled from reloadable brass casings fitted with Boxer primers.